Isn’t it amazing how turquoise is always so consistent. Its almost on parr with Navy. The obvious colours like black and white are always in, navy too is always about, but Turquoise is not often a hot topic, yet it always looks so gorgeous no matter what form it comes in. The beautiful shade comes and goes like the tides but is never unobtainable and is usually more prominent in pages of Vogue around the summer months, however its so classical and chic too when brought out in the form of a ring or necklace to add a pop of colour to a dark outfit in winter, as Cate Blanchett so gracefully showed us at the 2015 Academy Awards with her Tiffany Blue Collection necklace (below). That was one of my favourite outfits of the night, so simple but so elegant, effective and SO glamorous! Some of the hottest turquoise to be purchased right now, from Industrial kitchen stools to Converse & Missoni’s new collaboration Converse All Star’s (LOVE) all in my little collage of possibly my favourite colour (next to grey)…. 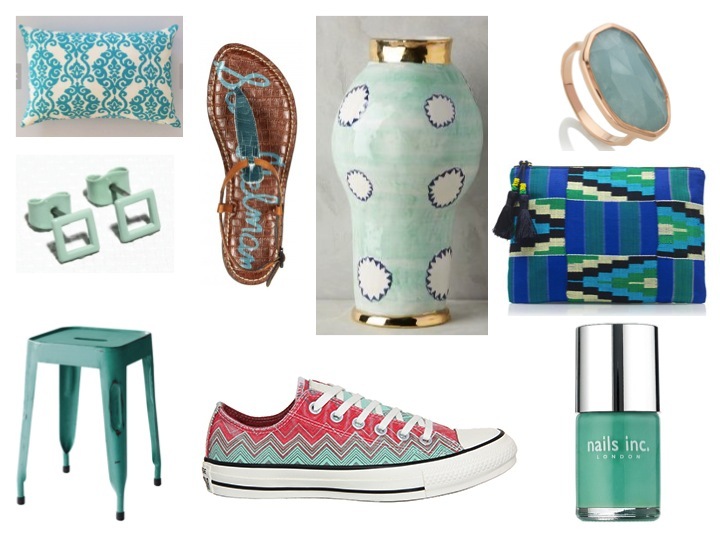 Try adding a pop of turquoise to your decor or outfit this week and see how you will love it. The shade suits everyone! Oh and don’t forget to check out Le Creuset’s Spring 2015 collection of cool mint kitchen ware, I adore it all.